When you sleep, what do you dream of? What do you dream of being? Who would you follow in the footsteps of? What dreams do you have of the future? What dreams will you pass on to your children or grandchildren, the next generation? These questions were asked of Liverpool and Wirral based school children, young people, and community groups, our dream catchers, as part of Culture Liverpool’s education and engagement programme accompanying the third and final visit of the world’s leading street theatre company, Royal de Luxe. The title and story of the four-day performance, Liverpool’s Dream, has been written by the company, in response to the spirit and the character of Liverpool. 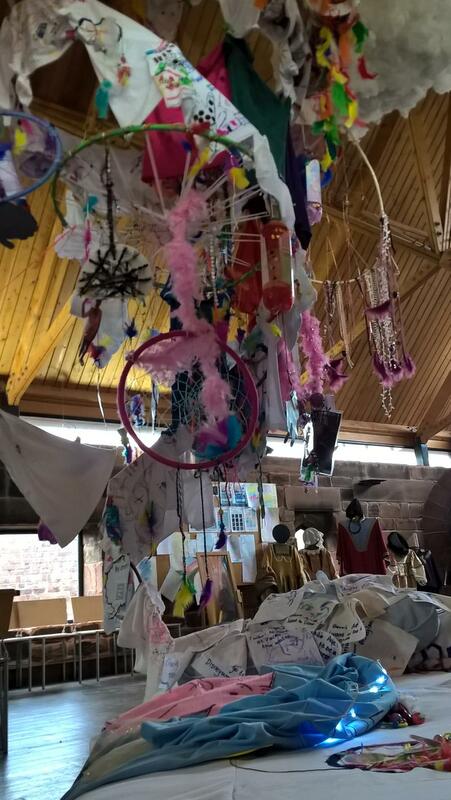 Our Liverpool dream catchers were asked to respond to these themes designing and creating beautiful picnic blankets for use at two Giant Picnics in the Park and to create t-shirts, football shirts, pyjamas and other art work inspired by dreaming. 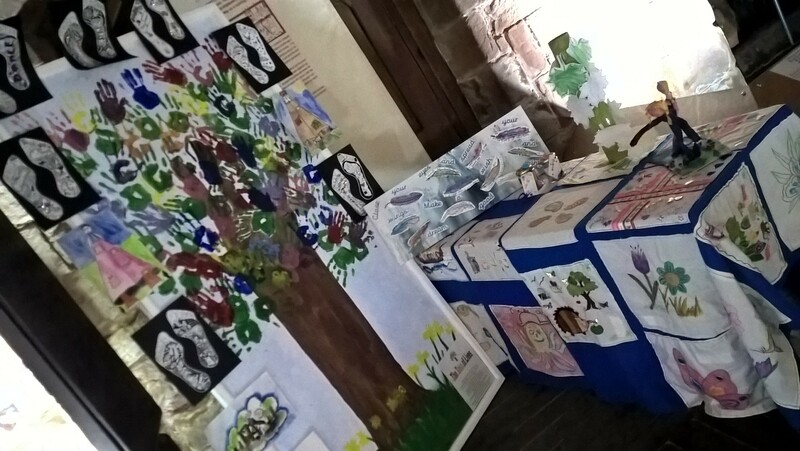 This work has been collated and curated into two exhibitions in both Liverpool and Wirral. 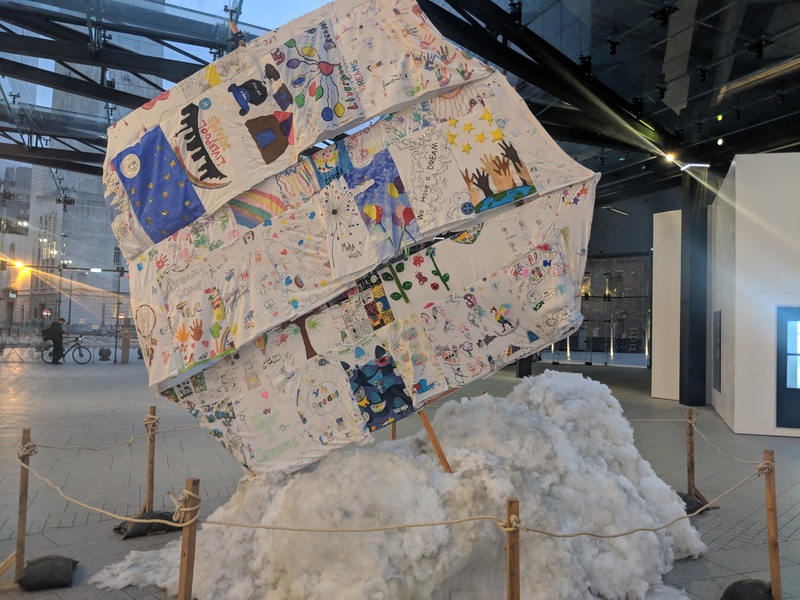 Curators Vari Kenny and Maria Hann have incorporated local schools and community groups artwork into an installation representing their dreams and celebrating the Giants last ever appearance. 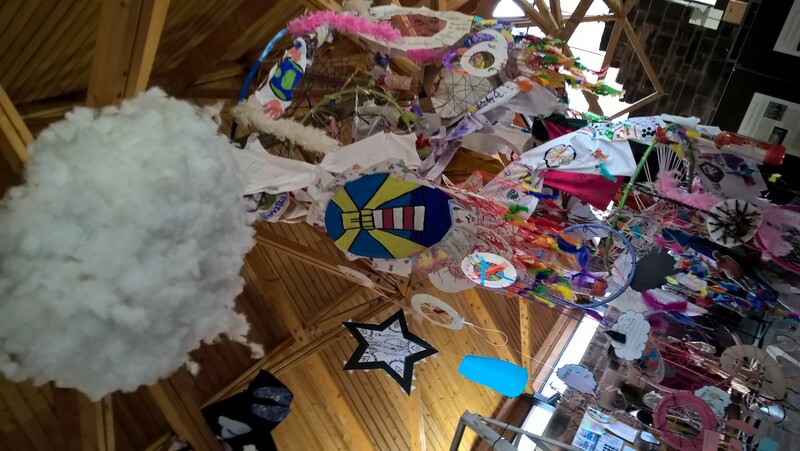 Sinking Sails reflects Liverpool’s maritime heritage and celebrates the dreams of our children and communities, ensuring that everyone’s dreams can easily set sail. 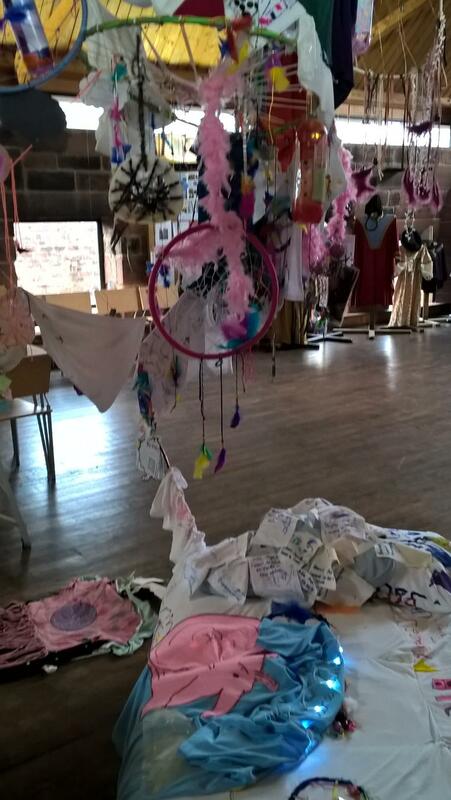 Take a seat in the clouds and listen to the voices of our dreamcatchers as the ship floats away with the dreams aboard. 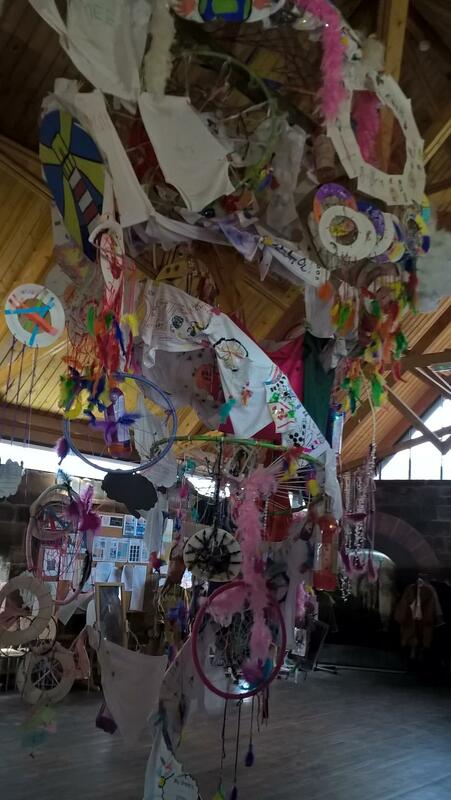 In addition, local artist Helen Davies led workshops to create dreamcatchers which you can also see displayed as part of the exhibition. 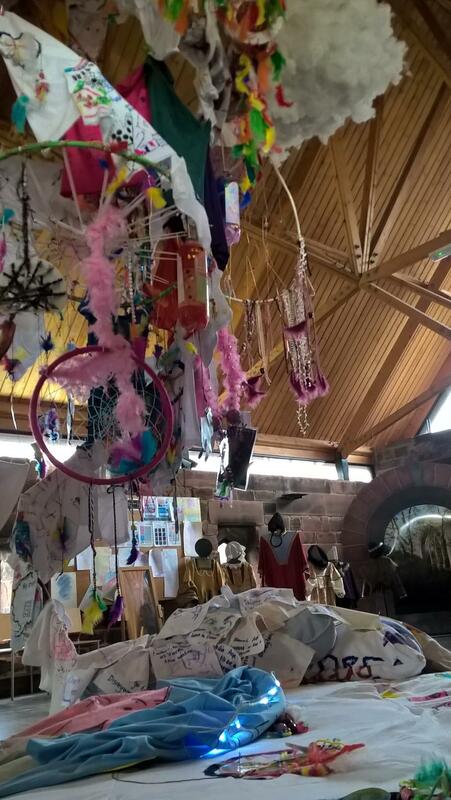 Again, Curators Maria Hann and Vari Kenny incorporated local schools and community groups’ artwork into an installation exploring the components of dreams and how these are formed during our resting moments. 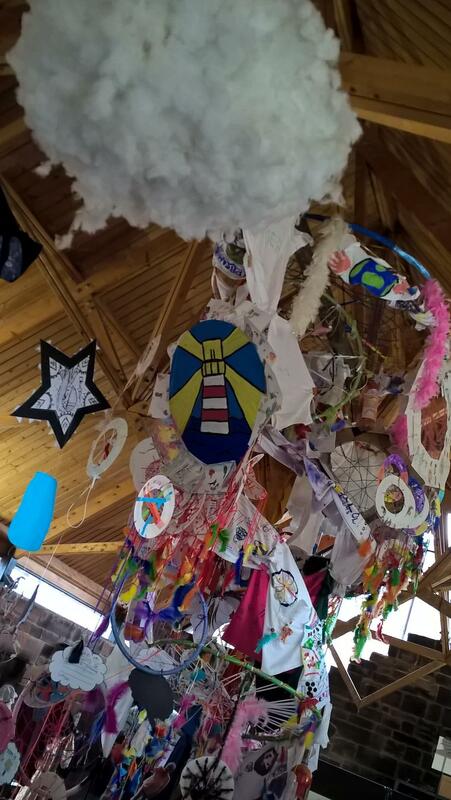 At the centre of ‘Sleeping Whirlwind’ is our tornado which sweeps together our dreams, aspirations and experiences. Lie in bed and gaze up into the eye of the storm whilst listening out for the breeze that carries the dreams of our local school children. Abbot’s Lea, Adventure Playground (Garston), All Saints Catholic Primary (Anfield), Anfield Community Arts, Bidston Avenue Primary, Crosby Brownies, De La Salle Academy, Dovedale Primary, Dukes & Duchesses Nursery, Foxfield Primary, Friends of Princes Park, Gateacre Comprehensive, Greenbank College, Hillside Primary, Holy Cross Primary, Holy Family Primary, King David Primary, King’s Leadership Academy (Dingle), Kollectiv, LIPA Primary, Little Angels Nursery, Liverpool Children in Care Council, Liverpool CC Granby & Dingle Children’s Centres, Liverpool College Prep, Matthew Arnold Primary, Millfields CE Primary, Mount Primary, New Brighton Primary, New Heights High, Norris Green Library (Little Sandbox), Phoenix Primary, Raeburn Primary, Rice Lane Primary, Sandfield Park Primary, St Alban’s RC Aided Primary, St Aloysius Catholic Primary, St Ambrose Primary, St Brigid’s Catholic Primary, St Christopher’s Catholic Primary, St Cuthbert’s Catholic Primary, St George’s Primary, St Hilda’s CE High, St Hugh’s Primary, St James Centre (North Birkenhead Development Trust), St Margaret’s Academy, St Oswald’s Catholic Primary, St Paul’s Catholic Primary, St Sebastian’s Catholic Primary, St Vincent De Paul Catholic Primary, Somerville Primary, South Wirral High, Springwood Heath Primary, Sudley Infants, The Beacon CE Primary, The Greenhouse Project, The Hive Youth Zone, Toxteth TV, Unity Youth Club, Windsor Community Primary, Wirral BC Targeted Youth Support – Creative Youth Development, Weatherhead High, Wirral Festival of Firsts, Wirral Methodist Housing Association, Woodlands Primary, Woodslee Primary and Mobberley Court.